Whether your single or a family of ten. 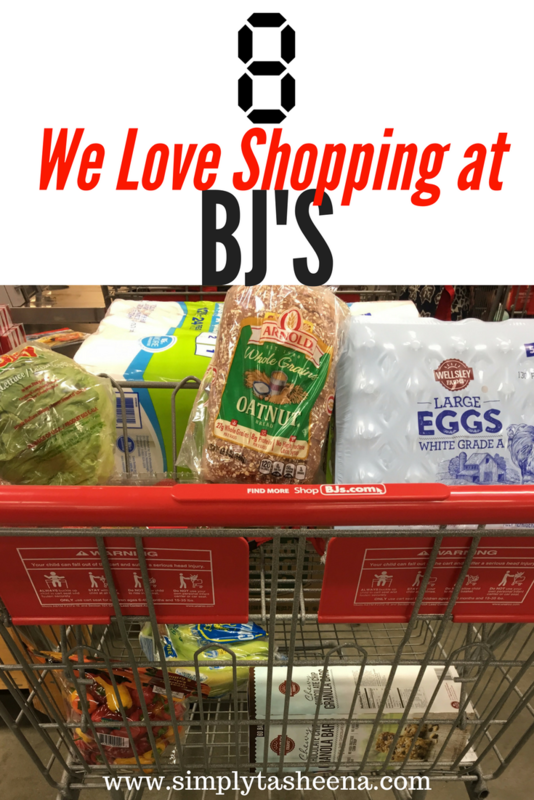 Today I'm sharing 8 Reasons Why We love shopping at Bj's Wholesale Club. A lot of people are under the impression that shopping at Bj's is just for large families and that's so far from the truth. Even when I was just a single mom I shopped at BJs because it allowed me to shop for the brands that I love for the fraction of grocery store prices. One of the reasons that I love shopping at Bj's Wholesale Club is because they give back to the community. Not only on a local level. But on a national level as well. When I spend my money at Bj's. I know it's being reinvested back into my community. Bj's is the only Wholesale club that accepts manufacturer coupons. On top of using A manufacturer coupon you also can use a BJ's in-store coupon and what's so awesome about that is Bj's mails a monthly coupon booklet with different coupons each month to members and BJ's also has in-store coupons that are also available in the store for members. When I visit my local Bj's I always check out the instore coupon rack to see if I can save even more on my favorite products. The Bj's Wholesale Club membership is worth the price alone with how much you save annually on gas. I can always count on that I will find the lowest prices at Bj's. I also love how periodically Bj's will have additional saving when you shop in store first you will get additional saving on gas. How cool is that? I currently have been looking into the idea of getting a Bj's credit card. You can save up to 5% cash back and ten cents off of a gallon of Bj's gas. My family cooks on the grill a lot throughout the summer and I love that I can get my propane refilled for a great price which is going to come in handy this Memorial Day weekend. Not all deli meat is created equal. Bj's has the best deli meat and cheeses that I've ever tried. My family favorites are the Rotisserie and Buffalo chicken. Thank me later!! I have everyone in my family hooked on these two deli meets. They have so many other deli meat and cheese options and they also can create a deli platter for your next gathering. Did you know that Bj's also sells ice cream cakes? My family and I are hooked on them. Seeing how it's graduation season. Bj's sells the prettiest graduation cakes that you can order and personalize. Bj's bakery items are so yummy from fresh croissants, bagels, and bread to cheesecakes. Bj's is my go-to spot for all my party needs. They even have the disposable helium tanks with the balloons included in the box. I'm always asked what I shop at Bj's Wholesale Club for and the answer is EVERYTHING! Soap, paper towel, Birthday cards (which are high quality and a great price), toys, electrionics, clothing, lotion patio furniture, flowers, garden supplies, luggage, tires, and supplements. Bj's is truly my one stop shopping place. When you don't feel like shopping in the store. You can order items online and have them shipped to your home. Don't forget about the Bj's Pickup and pay option. Where it allows you to reserve the items online and have them picked up in store. BJ’s Wholesale Club has over 210 locations in 15 states along the East Coast. I love that I can use my BJ's membership at any BJ's. I have used my Bj's card out of state on so many road trips. I am able to purchase gas and pick up snacks if needed. BJ's Wolesale Club is currently offering a free 90-day membership. Sign up for a free 3-Month Membership here and watch the savings pile up! Are you a Bj's member? What's your favorite item to purchase? Great, you can find everything under one roof at such stores. Wow! What a great offer. It's really a great idea they have by giving back to the community. BJs looks like a great store. I wish we had one nearby. I'd so check it out. I want an ice cream cake. Seems a great store.. We don't have this one here in India, but so many of such stores are there here to enjoy all at one place with good savings! I love BJs. We use to go there when I was younger and now I take my family there. I love buying in bulk, a must for a big family! Love the store. Almost everything you need is there.